Do not adjust your computer screens. The outfit you see to the left was intentionally sewn big. LOL! 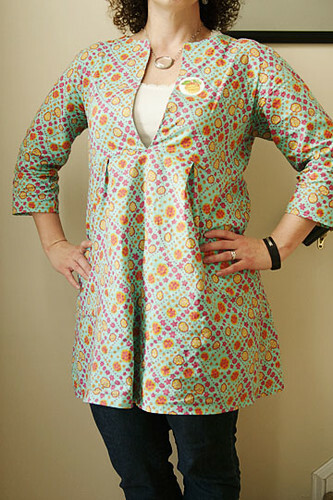 My final sample for the Original Sewing & Quilt Expo and Greater Atlanta Shop Hop is the Flora Tunic & Twirl Skirt by Sew Liberated. 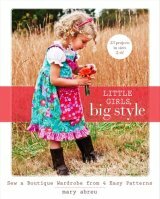 I have long admired Meg’s aesthetic and was so excited when Sarah started carrying her patterns. This makes the third one I’ve sewn, I think! Because this was made as a shop sample, I intentionally made it too big for Miss L to wear right now. She’s a pretty skinny size 5 and I cut out the size 6 for both the top and the skirt, thinking she’d wear them next year. Unless she has a massive growth spurt and goes straight to an 8 in the next year, I suspect she’ll get two years out of this outfit. It’s a raglan style top with elbow-length sleeves and a neck facing, which came together pretty quickly. I think I’d like to make another closer to L’s current size so she can wear it this spring and summer. It’s just a nice basic top that would go with pretty much anything. For the skirt, Sarah and I picked out a pretty Alexander Henry home dec fabric plus some of Patty’s Mezannine line for Michael Miller Fabrics. I think it makes for a sweet, Spring-y outfit that’s a little dressy and a lot comfortable. I followed the directions for the skirt, more or less. The directions have you cut the skirt pieces perpendicular to the grain, so if you’re going to follow them, I’d steer away from an obviously directional print. 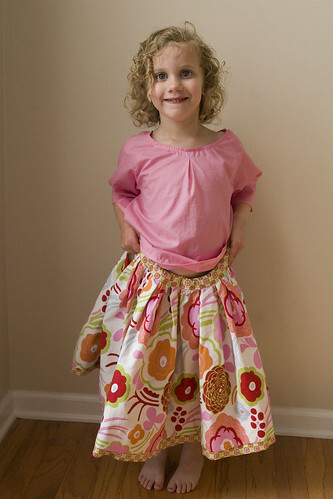 The pattern recommends home dec fabric for the main skirt and mid-weight fabric for the hem band and waistband. In the future, I think I’d use all quilting cottons. The home dec fabric just fit when gathered to the waistband but the 1/2″ non-roll elastic wasn’t strong enough to pull in the waistband (that’s why Liesl is holding up the skirt). After I took the picture, I ripped out the elastic and replaced it with 3/4″ non-roll elastic and it made a huge difference (although it was a tight fit to get it through the casing). I did do all machine sewing on the skirt; the directions call for handstitching in two places but I’m just too lazy to do it. I might be more inclined if I were using fancier fabrics or going for more of an heirloom-sewing look, though. I’ll be a the Original Sewing & Quilt Expo this morning, working the Intown Quilters booth, so come say “hi” if you’re in the area! There’s always a sense of accomplishment and relief for me after I drop off Miss L’s old clothes at the semiannual boutique consignment sale. It’s a bit of work to get to that point — especially if you wait until the day of your drop-off appointment to get everything ready, hypothetically speaking of course — but so much easier than some of the alternatives. I’ve been consigning at this sale for a couple of years now and confessed to the owners back in the spring that I might have less to bring in, since I’m sewing so many of the girl’s clothes these days. “Bring ’em!” they said. I wasn’t sure if I would but as I sorted clothes today, I figured it wouldn’t hurt to at least try. I think I ended up taking about 10 or 12 things, some outfits and some made-to-match pieces, that I’d sewn. As the volunteers were checking in my items, we chatted about what I’d brought, little things like how small something ran (I’m still bummed that the cool Meli Meli jacket I bought had sleeves made for an infant with monkey arms) or how sad I was that Liesl’d outgrown a particular dress. Someone saw my label on something and asked where to find it, and I admitted it was mine. I still feel a little awkward talking to people about my sewing and I really can’t put my finger on why. I think I tend to like more passive forms of self promotion instead of those that involve me talking about myself and my work! LOL! I have finally gotten comfortable enough to carry around my business cards and hand those out when people ask for them, although it does make me feel all grown up and stuff. Although, to be perfectly honest, I’ve always been a bit reticent when it comes to my sewing. I just don’t like talking about me. (And, yes, I see the irony in that comment, since this is my blog. Humor me.) That’s what I’ve always liked about journalism — I get to meet and talk to interesting people and write about them. I’m only a small part of that equation. I’ve spent nearly two decades honing my ability to encourage people to open up to me and then really listen to them. Having the tables turned about a topic that’s so personal to me just freaks me out a bit. I felt like a proper introduction was in order, after sharing her in a less-than-flattering shape a couple of weeks ago. Thanks to a helpful friend, I purchased an Obitsu body for her and now she’s ready for some fun. Maureen is a Little Red Riding Hood Pullip and has the most beautiful red hair and green eyes. Her stock costume doesn’t fit this body — it’s a little bit bigger — so I ran to the store and picked up a Barbie dress for her to wear until I can sew something for her. Boy, have Barbie clothes changed in the past 30 years. I had a rough time finding something that I could actually stomach. Definitely need to make this girl some clothes. 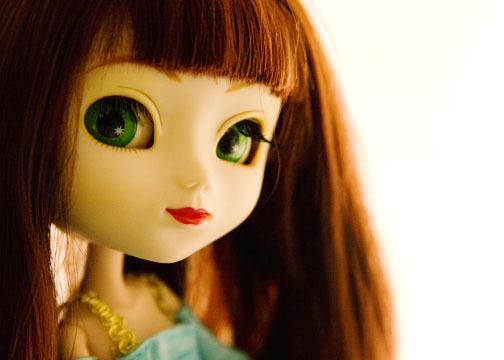 I was surprised to find myself interested in Pullips at all. I’ve found dolls, in general, rather creepy since watching Poltergeist as a youngster. (I’d rather not relive that particular horror, so I’m not going into details here.) Cruising Flickr gave me the chance to see a world I’d never before imagined and I soon found myself daydreaming about owning a Pullip. It wasn’t long before I started looking at online stores and finally buying one. Of course, it then took more than a year for me to break her out of her box. Why? I’m not totally sure. I wanted the time to devote to sewing for her and taking pictures, but never found a big enough chunk to let me do either. The day Miss L found my poor, boxed LRRH, she insisted I open her right then. Who can say no to a bossy three-year-old? And now I’m thinking Maureen needs a friend, preferably someone with curly hair. Guess I’ve found another hobby.